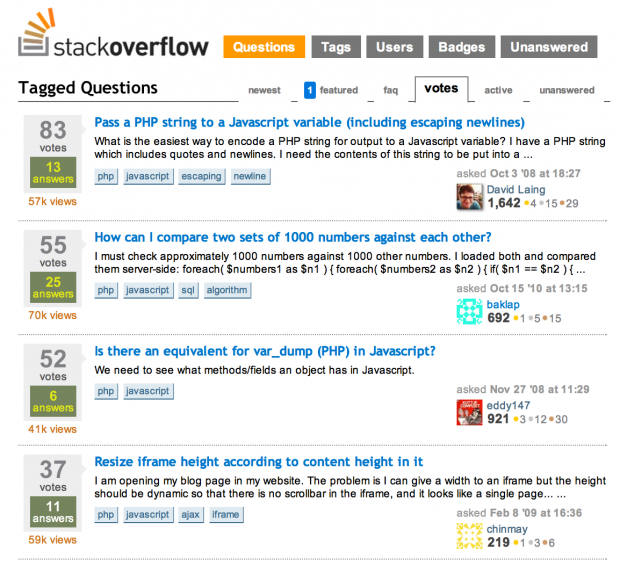 StackOverflow is neither encyclopedia, forum, nor blog, but rather a combination of all three that is specifically designed for programmers and developers. 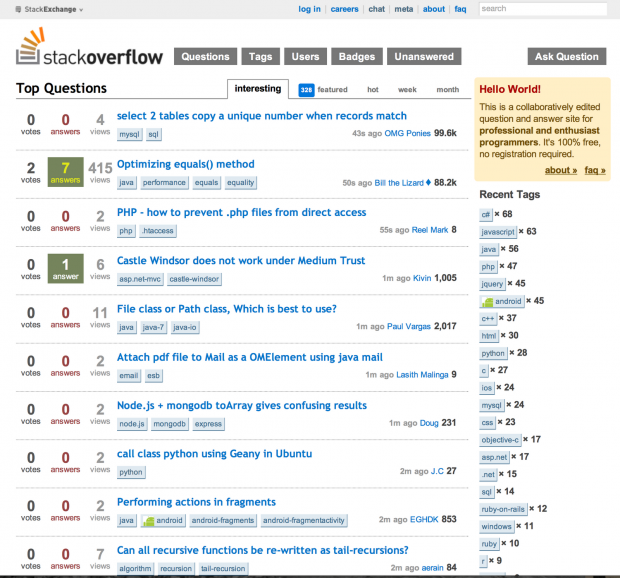 It’s a community for programmers to answer and ask programming related questions, a place where developers can vote on most useful answers, and an encyclopedic resource for thousands of techies to troubleshoot their problems. The site is completely built upon user contributions and currently boasts 1.2 million users, 6.6 million answers, and 13 million comments. StackOverflow is great to source because it’s jam packed with excellent candidates and loaded with tons of information about what those candidates’ skills look like! Imagine the site as a playground for coding aficionados. Engineers come here to find answers to the technical questions they are struggling with (i.e. programing on the new windows mobile system or building a complex Java infrastructure), to show off their coding skills, and to connect with other techies who have similar interests. And they come here every day, not once every 18 months, like LinkedIn! So their StackOverflow activity is going to be a better reflection of what they do, professionally, thank their sparse LinkedIn profile. And the best thing about it all? Other StackOverflow users rate every question and answer–all of a given engineer’s activity on StackOverflow–which is then compiled into easily accessible profiles, along with links to personal blogs, twitter, and anything else you can imagine. The better question is, why AREN’T you sourcing on StackOverflow. So the only thing that should be stopping you now is learning how to search StackOverflow. We will click on the “votes” tab to return answers with the most votes. This will bring back more relevant content since we want to find top candidates. By the looks of this list, we have already returned some promising candidates. However, we will cover how to search through user profiles in a moment. Now that we have covered the basics, let’s learn how to search StackOverflow like a pro. 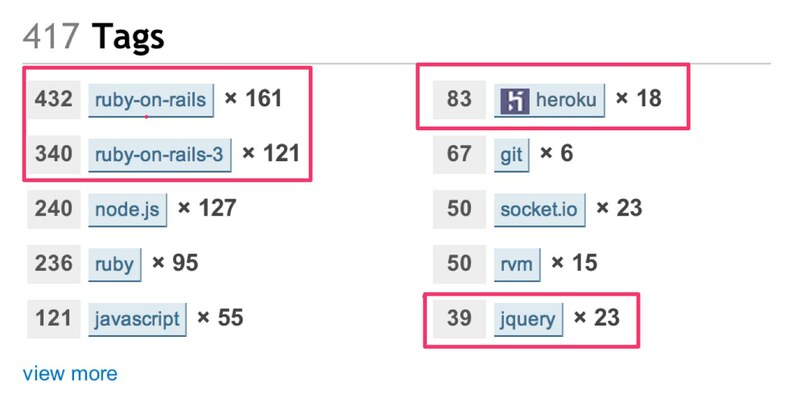 This strategy is by far the best way to search StackOverflow. In fact, very few users use the StackOverflow search interface to search the site for questions, most revert to Google. Searching with Google will allow you to filter your search for people that are in a certain geographic area, and that have personal websites or blogs, which is crucial for outreach. site:StackOverflow.com restricts the search to only results from the StackOverflow domain. inurl:users limits results to only user profiles. *Remember to add the OR operator to search multiple locations, i.e. 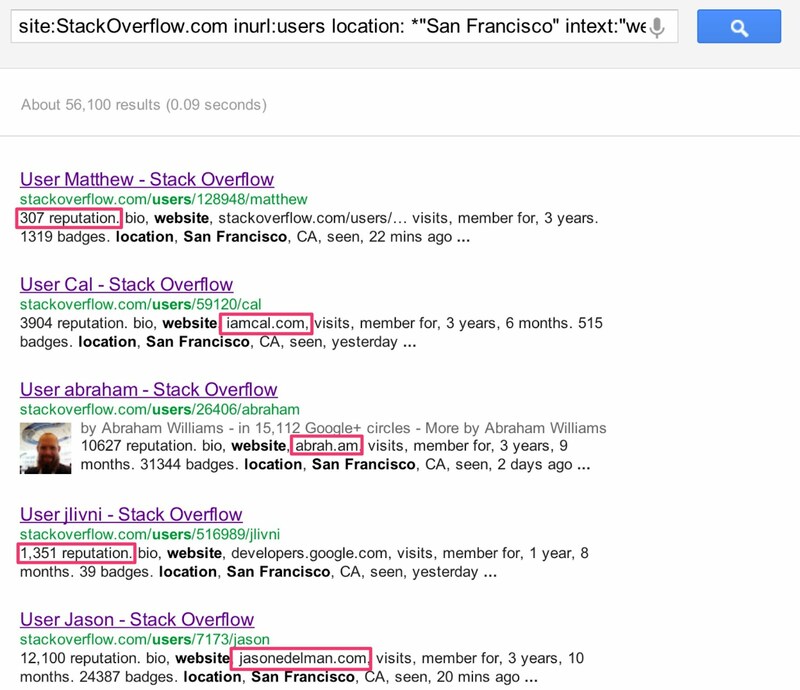 *”San Francisco” | “Bay Area” will pull user results that either have San Francisco or Bay Area as their location. **One alternative is to use “wordpress” instead of “website” to only return user profiles that link to personal wordpress sites. This has proved useful when looking for users with contact vectors on their “About Me” blog page. These are some of the results my search pulled. A great list of user profiles, most of which, contain links to personal blogs with contact vectors. Results are in no particular order so don’t forget to dive deep into your results for more candidates. There are some hidden gems on page 10+ of this search. And in addition, his personal website offers multiple talking points to include if you wanted to send him a personalized email. So you found a user, in our case Brandon Tilley, and now you want to get to really know them. 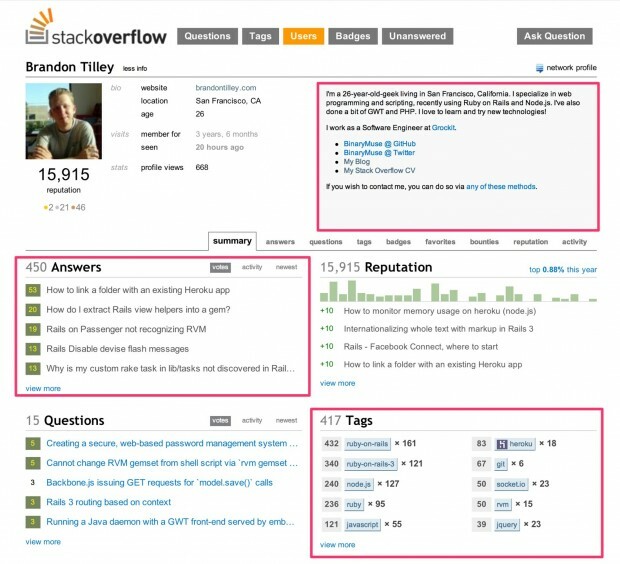 Although Brandon has already told us a lot about himself, let’s dive deeper and see what his StackOverflow profile has to say about him. A look at his personal section gives us a general glimpse of who he is and what he is about. Under “Bio” you are likely to find location information and a personal website. In Brandon’s case, he has listed a link to his blog, and tells us that he is located in the San Francisco area. Users also have a personal section that they can choose to link to personal projects, or write a quick blurb about themselves. 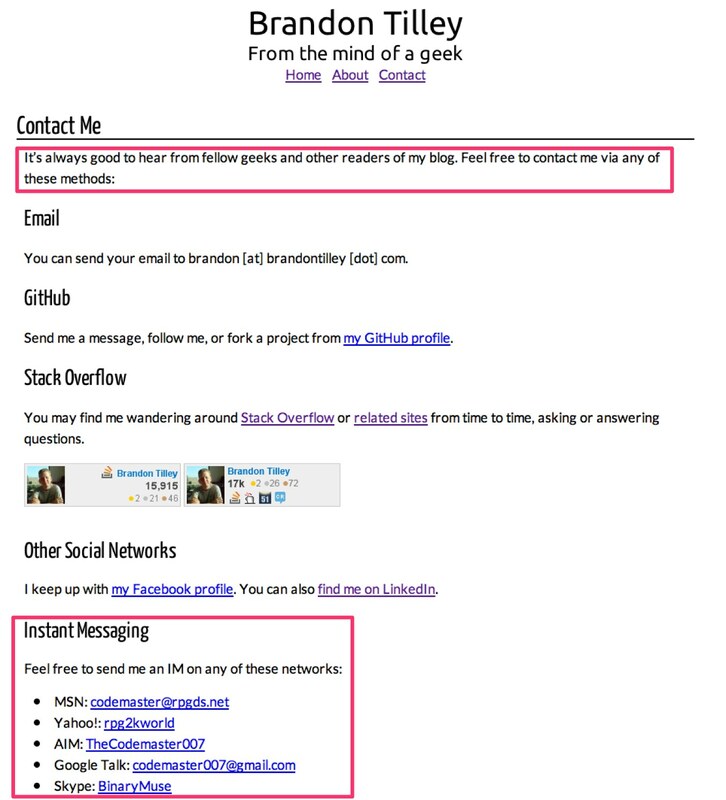 Brandon has linked us to his github page, his twitter page, and given us multiple contact vectors. Scrolling down the page we find the questions and answers that Brandon has contributed to the site. 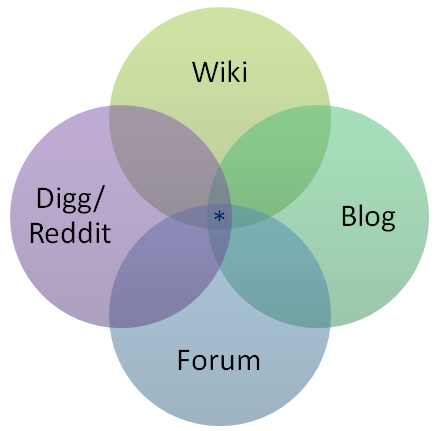 A user is classified by the questions and answers that they create and they are attributed a ranking based on how these questions and answers are received by other users. In Brandon’s case, he has a ranking of 15,000+ which is in the top 0.88% for this year. 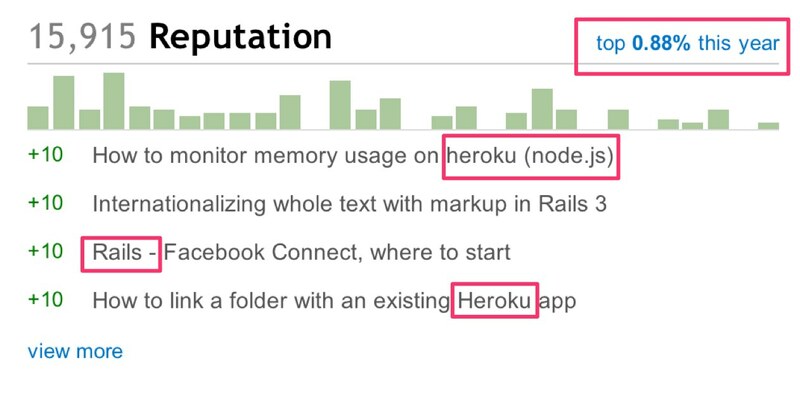 And if you want to see exactly what the questions he is answering, click on the Heroku tag and you will be brought to a list of the 18 heroku related questions Brandon has answered. Not only will looking at a user’s questions help understand the breadth of their technical expertise, but reading their answers is a great way to get a feel for what kind of person they are, and can be very useful when reaching out or qualifying a candidate. How do they address others? How do they respond to criticism? Do they communicate solutions effectively? In summary, look at a users rating, scan the questions they are answering, look at the questions they are asking, and click on the tags that they have been associated to. StackOverflow is a great resource to qualify a candidate. You can find loads of info on their technical background, and get a real overview on what kind of programming they are able to do, unfortunately, it doesn’t always offer the best contact vectors. But fear not, if you do come across a candidate without a website link, you can still search for other contact vectors with a simple google search. One such example is Ron Harlev. His StackOverflow profile was enticing, but unfortunately, justanswer.com was not useful for reaching out to him. With a quick name search in Google, however, I was able to find his Linkedin and Twitter profiles. 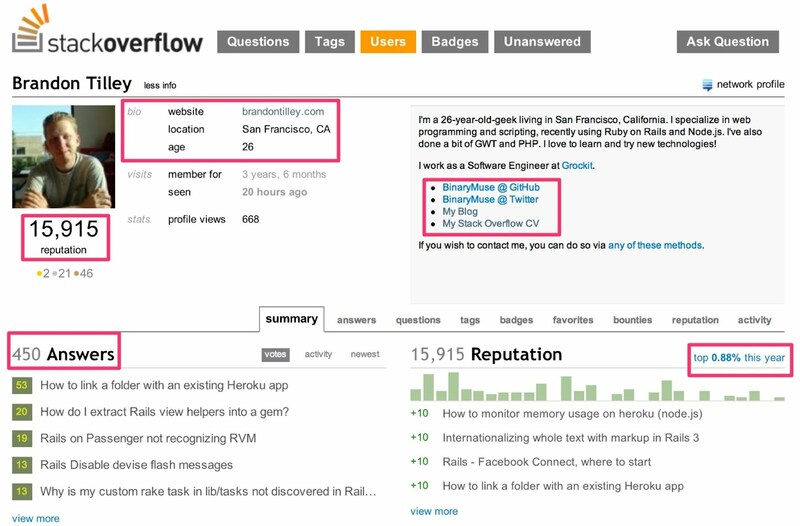 Disclaimer: Remember, we don’t claim StackOverflow is the only source of candidate information online, we recommend using StackOverflow to find candidates that aren’t elsewhere, and to show your genuine interest in the candidate’s abilities as demonstrated on their StackOverflow profiles. Take advantage of the information on these profiles so you can send that user the one email that stands amongst the crowd and actually piques his/her curiosity. 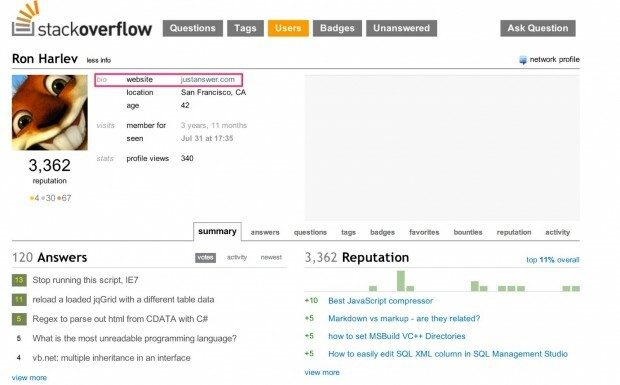 Specifically, you’ve learned how to search on a brand new source: StackOverflow.com. 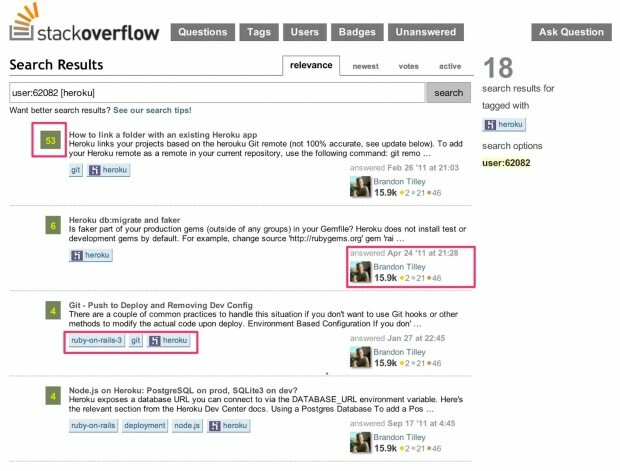 Searching consists of either using key terms or tags within the StackOverflow search interface, or pivoting out into Google using a filtered search that returns user profiles by location. You’ve also learned the basics of a StackOverflow user profile, and how to look understand a user’s rating and link to a user’s tagged questions they have answered. Most importantly, you’ve learned that the web is a pool of candidate information waiting to be interpreted. StackOverflow is only one such example, being an untapped resource with unparalleled depth and uniqueness of user information. Candidates aren’t hanging out on Linkedin, they are tweeting about cool projects they are collaborating on on github, and answering questions from fellow programmers on StackOverflow. It’s important for sourcers to think about harnessing the power of this open web data. You can do it manually, or you can use specialized tools like TalentBin’s Talent Search Engine.